1. The MPOA dredging contractor re-mobilized and completed Wickline Island. They then re-positioned and began dredging at O’Brien Shoals. They were able to complete the area shown in red below, before encountering thick deposits of rock “cobble”, ranging from golf-ball to tennis-ball size. The dredging of this cobble caused the larger on-shore booster pump to break down, leading to a dredging work stoppage of approximately 11 days until a replacement booster pump could be located and brought in. 2. A June 2nd site visit by the MPOA dredging consultant and dredging contractor, and subsequent field investigations by the dredging contractor, determined that similar cobble deposits are present throughout the remaining areas to be dredged at O’Brien Shoals. Since then, the MPOA dredging consultant and dredging contractor continue to have on-going discussions on how to complete the remaining areas at O’Brien Shoals. In the interim, the dredge has moved back into South Bay so that dredging work could resume. Until an alternative is developed, lakefront landowners in proximity to O’Brien Shoals dredging areas can install their piers, and the MPOA has re-installed appropriate buoys at the typical O’Brien Shoals locations, as needed. The MPOA will post additional info on the MPOA website as we receive it. 3. We continue to move forward with the IEPA Section 319 grant projects, including the MPOA’s project to install shoreline protection around Strom and Yacht Club Islands. We have received the County and Army Corps permits, and it is planned to complete this project in Fall 2017. Additional 319-funded projects are also being pursued with individual landowners around Wonder Lake as well. 4. The on-going effort to discourage Cormorants from congregating on Strom Island seems to be working well. 5. Lake users need to be aware of changed lake bed conditions where dredging has already occurred, particularly near swimming beaches, or other shallow areas. Deeper areas, with drop-offs many now exists that were not previously present. 6. 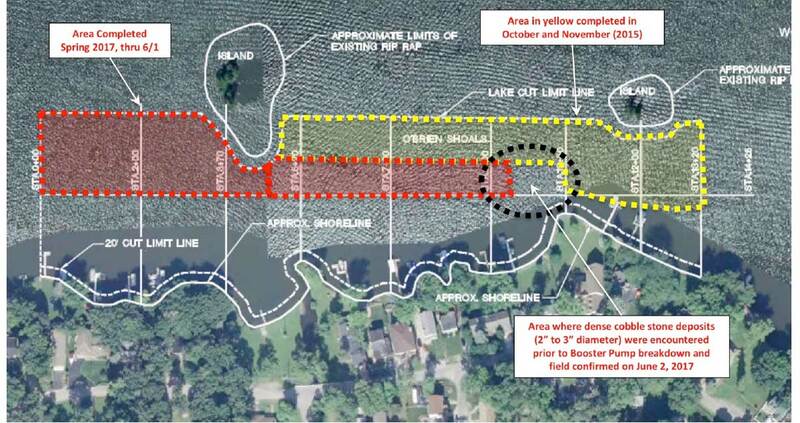 Lake users need to be aware of rapidly changing lake surface conditions as the dredging contractor will be re-positioning the sediment pipeline, booster pumps, and other dredging-related equipment as they progress. Avoiding those areas of the lake is the best bet, when possible. 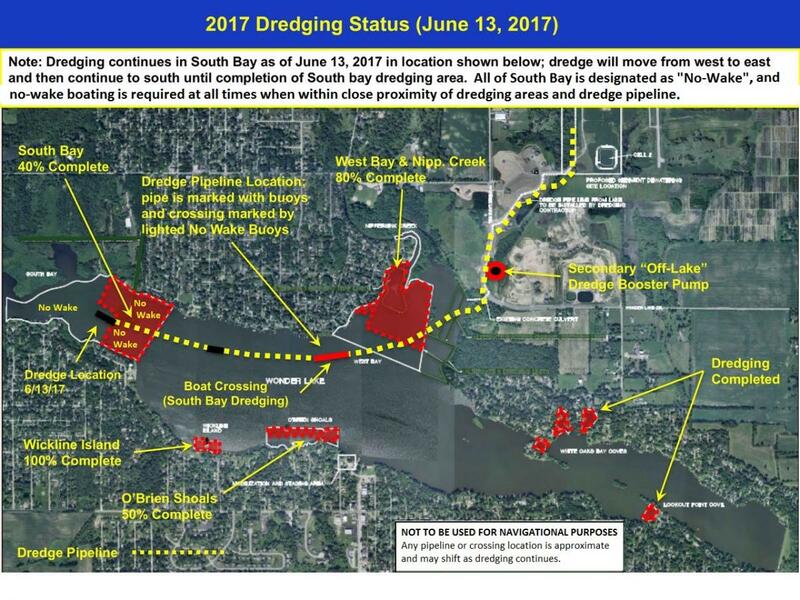 The dredging contractor has placed additional weights on the sediment pipeline at the designated crossing point (which will hopefully minimize the rise and fall of the pipeline) and has added red marker lights on top of the “no-wake” buoys on either side of the crossing point. As in the past, only use this crossing point at the mid-point at a no-wake speed, utilizing your tilt mode if applicable. The map below shows the most current surface conditions on the lake.